Causal Agent: The trematode Clonorchis sinensis (Chinese or oriental liver fluke). Embryonated eggs are discharged in the biliary ducts and in the stool . Eggs are ingested by a suitable snail intermediate host ; there are more than 100 species of snails that can serve as intermediate hosts. Each egg releases a miracidia , which go through several developmental stages (sporocysts , rediae , and cercariae ). The cercariae are released from the snail and after a short period of free-swimming time in water, they come in contact and penetrate the flesh of freshwater fish, where they encyst as metacercariae . Infection of humans occurs by ingestion of undercooked, salted, pickled, or smoked freshwater fish . After ingestion, the metacercariae excyst in the duodenum and ascend the biliary tract through the ampulla of Vater . Maturation takes approximately 1 month. The adult flukes (measuring 10 to 25 mm by 3 to 5 mm) reside in small and medium sized biliary ducts. In addition to humans, carnivorous animals can serve as reservoir hosts. Endemic areas are in Asia including Korea, China, Taiwan, and Vietnam. Clonorchiasis has been reported in non endemic areas (including the United States). 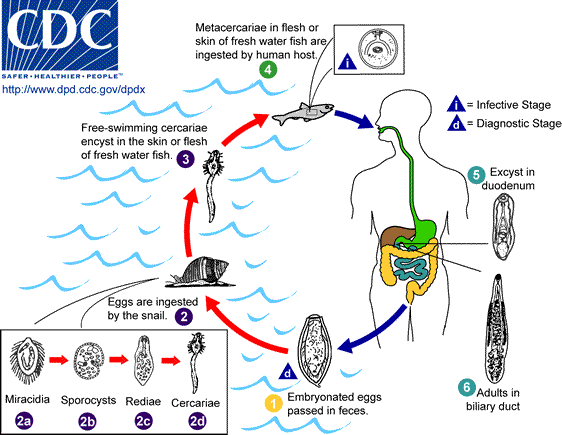 In such cases, the infection is found in Asian immigrants, or following ingestion of imported, undercooked or pickled freshwater fish containing metacercariae. aktuell 05:04, 23. Nov. 2014 562 × 435 (40 KB) GifTagger Bot: Converting file to superior PNG file. (Source: Clonorchis_sinensis_LifeCycle.gif). This GIF was problematic due to non-greyscale color table.